Since the day we returned the City Select Double Stroller after our review we had since stopped going out with both Ayra and Zara. 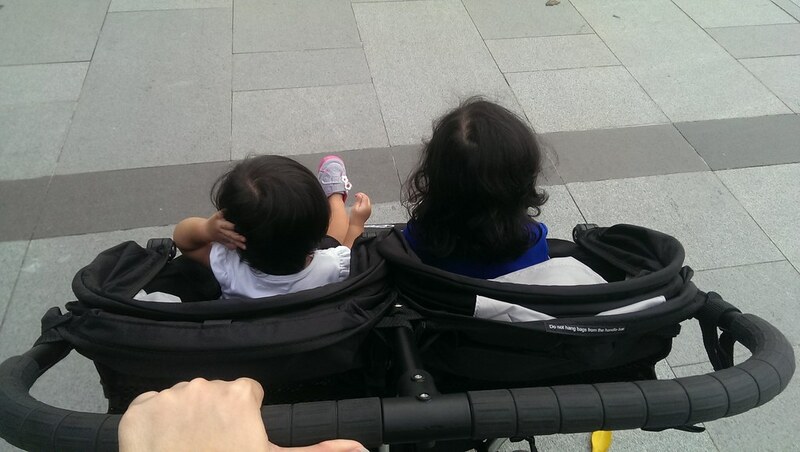 Those few weekends without a double stroller were spent at home. Probably because the two girls would rather be carried more than they would like to walk on their own, unless we are in a toys store, the library or at a playground. 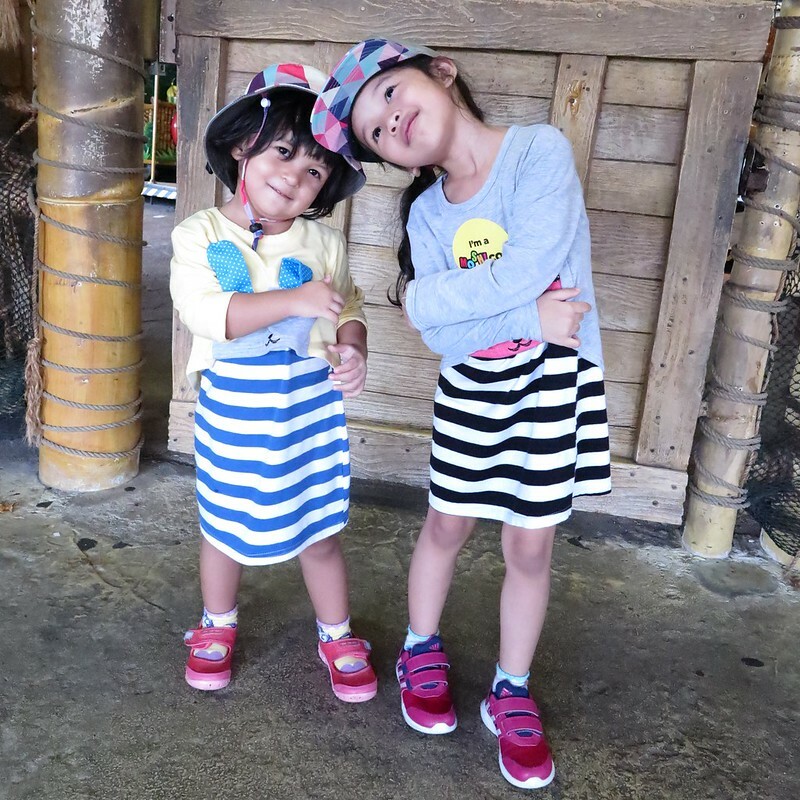 So going out with both of them can be quite a muscle training session for us. Thanks to Baby Jogger, we can now go out anytime to anywhere we want because we have got the City Mini Double! Call us lazy you may, but with this double stroller, we are going out every weekend! The girls love their new stroller and would stay in it for almost the entire time we are zooming around from places to places. 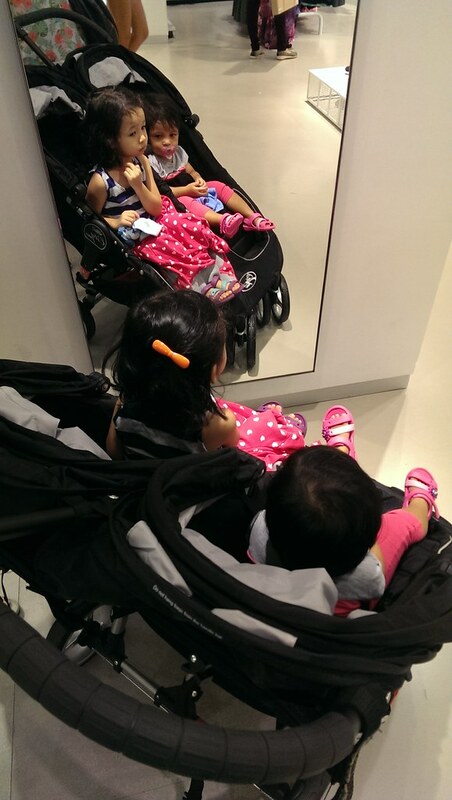 As both girls are happy and comfortable in the stroller, we had no problem spending an entire day out shopping with them. And the big basket below the stroller means no need for hanging bags nor accessory to hold the bottles and diaper bags, just dump everything into the spacious basket, easily accessible from the sides of the stroller. Either or both of them can recline down to rest or sleep without having to disturb the other child’s comfort. 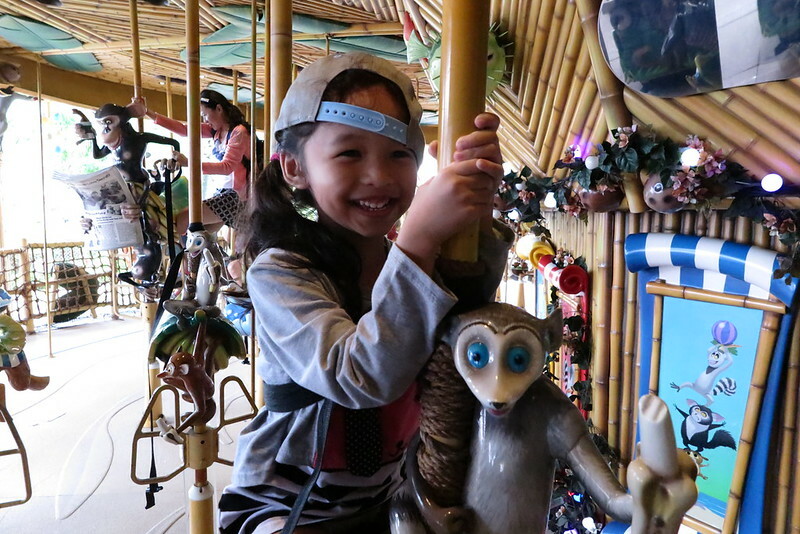 This is one plus for us as compared to our experience with the City Select, as we had to bring the kid out from the seat to turn it to face the right direction in order for one or both of them to lie down comfortably. 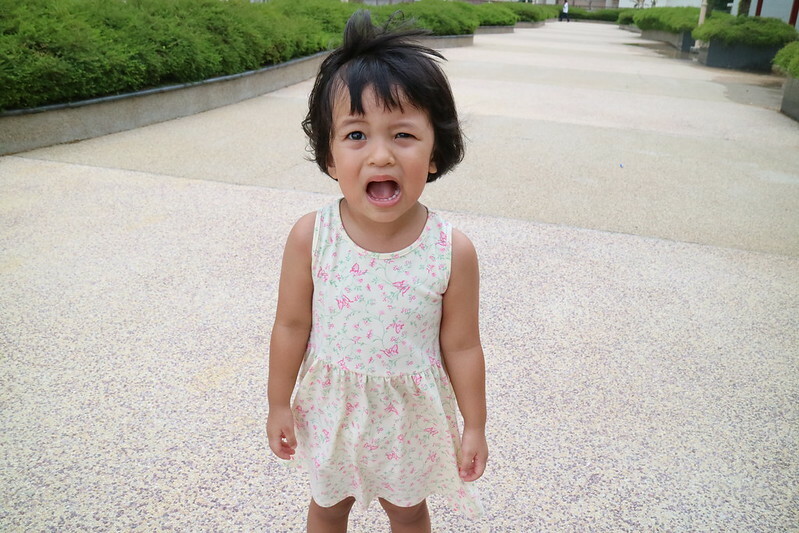 Our first time at Botanic Garden with the girls, and I think we will be heading there more often now. The friendly carpark is stroller accessible and we can get in and out of the carpark, Food For Thought restaurant and the garden very easily. Will plan a family picnic one of these none rainy days! Single hand pushing possible too! Those who did not try it before may think pushing a wider stroller is going to be more tedious and difficult to manoeuvre. After using the Citi Mini Double for a month now, we are all loving it! Pushing the stroller around is effortless, and 8″ lightweight front wheels makes going in and out of the train easily; no more wheels trapped in gap! The front-wheel suspension also makes pushing through patchy grass area or sandy places at the beach so much easier and more enjoyable for the girls. The one main feature we prefers more in the City Mini Double is the easy fold. Just lift the two straps on the seats and the City Mini Double folds itself! The stroller can be stored compactly in an upright position. 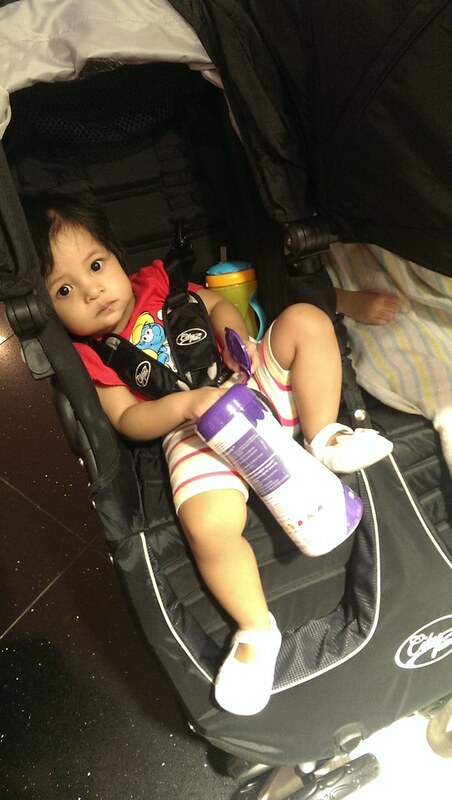 Just look at how comfortable she made herself in the stroller, with her snacks and water bottle within reach. 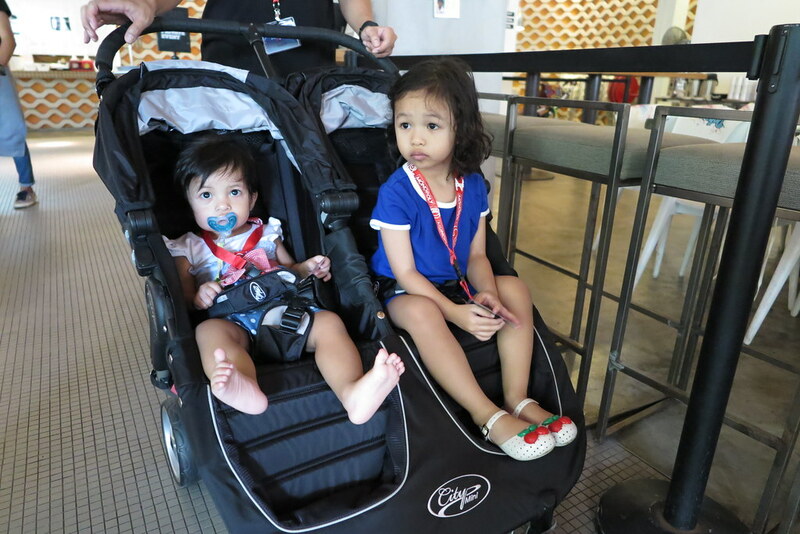 Thanks to this very versatile and steady stroller, Ayra and Zara are getting to go out more together. And the mummy me need not have to strain those muscles carrying the girls for prolong hours while going out together. This is a win-win for the girls and me! Thank you Baby Jogger! Previous Post Toys Craze: Ayra the DOHVINCI Designer, Making Creativity Pops!